Here you’ll find travel reports about Trpanj. 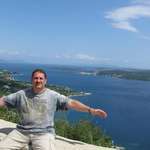 Discover travel destinations in Croatia of travelers writing a travel blog on FindPenguins. After another day of hill climbing through The Bora (nasty cold wind) ... We found a bath tub and had our first bath in over 2 months!! Those are the best photos!! Thanks Gem. I never expected the hotel's hand soap to be quite so bubbly!